ND Store Fixtures is proud to bring brand new gondola store shelving, great for merchandise in your store. They are free standing units, and made with heavy duty steel. The standard backing for these units are pegboards. Available heights of 54"; 72"
These new gondola shelving are perfect to place in the center of your store to display and store your items, like convenience stores, gas stations, book stores, gift stores, electronics, pharmacy, are just a couple of examples that these gondola units can be utilized. Have a floor plan but do not know exactly what you need? 2. What is the difference between a starter and a add-on unit? Ans: A starter unit is the first 4ft unit used to begin a new "Line/Row", the add-on units are then used to extend that same "Line/Row" by 4ft lengths. Example: Your business requires 3 Lines/Rows of 20ft Gondola Units. This means you need 1 Starter Gondola Unit to start each of the three Lines; and four of the Add-On Gondola Units for each of the lines. 3. 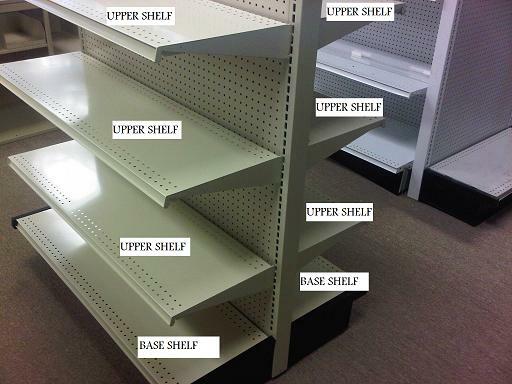 What is the difference between "Base Shelves" and "Upper Shelves"? Ans. Each gondola section has 2 "Base Shelves", which are included in the price of the Starter & Add-On Units. 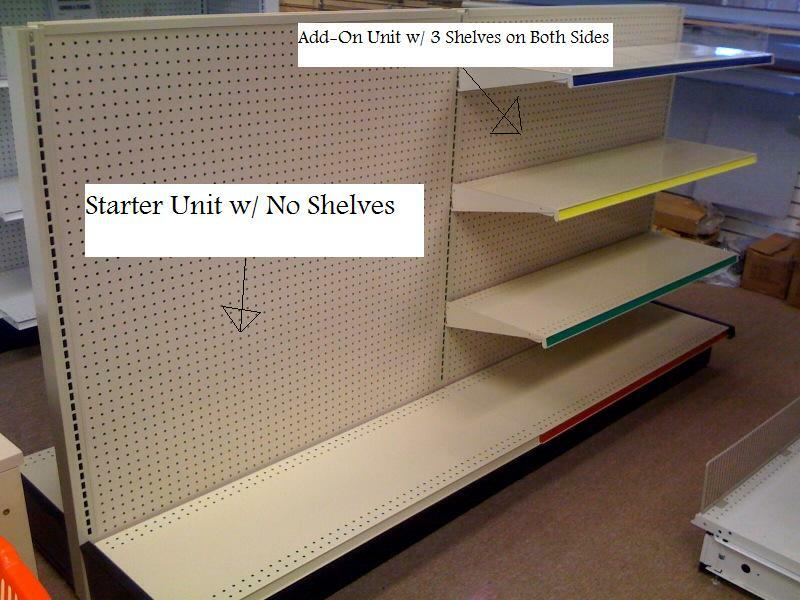 While "Upper Shelves" are sold separately, as each customer will have different requirements based one their product line. Below is a sample of Base & Upper Shelves.